Submitted by Alexander Briones on Sep. 18, 2018. First published on Dec. 19, 2015 and last updated on Sep. 18, 2018 by Alexander Briones, Denise Azucena and Jason Horton . This is the September 2018 updated version originally by Jason Horton with Denise Azucena researching and writing some of the summaries of keyboards that were added in 2017. The great thing about 25 key MIDI controllers are their portability and the small amount of space they take up. They're not designed to replace a full size keyboard, but rather to offer convenience - that said some of the higher-end options are packed with an impressive range of features these days. What Type Of Connectivity Do You Need? It's becoming ever more commonplace for MIDI controllers to only have USB ports on them, so if you need to directly control instruments that only have the MIDI style 5 pin DIN connector then you'll need to ensure the controller you buy has a standard 5 pin MIDI out port, otherwise you'll also have to buy a USB to MIDI converter. When I was reading reviews from people who had returned a MIDI controller to the store they bought it from, the number one reason was because they bought one that only had USB when they needed a 5 pin DIN out MIDI port. Key Size & Weight. Although some 25-key controllers have full sized keys, many don't. Most of them also don't have full weighted keys. If you're a piano player and you need these features then read the specifications carefully. If you do need something bigger then take a look at our guide to 49 Key MIDI Controller Keyboards. Power Supply. If you need one for portable use with a laptop or tablet then you need one that takes its power from USB, however this comes at the cost of draining your device's battery more quickly. You also may have problems getting enough power from the iPad which provides only 20% of the USB 2.0 standard of 500mA - if you have a problem you'll need to get a powered USB hub. Pads, Mod Wheels, Aftertouch If you need these features then read through the specifications carefully as some of the lower priced options don't always include these. 89 out of 100. Incorporating 80+ ratings and reviews. 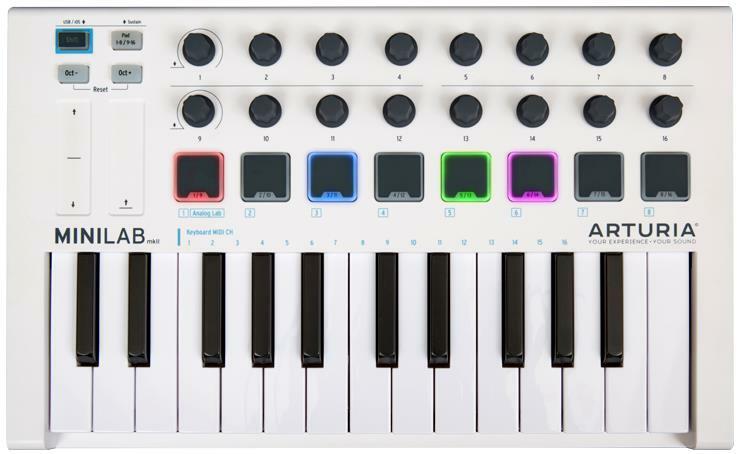 The Arturia MiniLab MkII is a mini-laboratory of MIDI controls with emphasis on portability. To save on space, it features 25 slim keys, but they do have velocity sensitivity. It features 16 encoders for more control over your DAW software, and 8 customizable RGB pads for triggering samples, with two banks to work with. Finally, it comes bundled with nifty software which includes Ableton Live Lite, Analog Lab Lite and UVI Grand Piano. Dimensions: 14" x 2" x 8.7"
This MIDI keyboard is gaining quite a lot of positive reviews, more than enough to secure a spot in this list. Overall build quality seems to be its strongest trait, and coming in close second is the playing feel of its slim keybed, which many appreciate. Cosmetic value and portability is also commended often. It also scored a number of high ratings with its good compatibility. Not many complaints hardware wise, but there are a few who report software compatibility and setup issues in negative reviews even though others had the opposite experience. 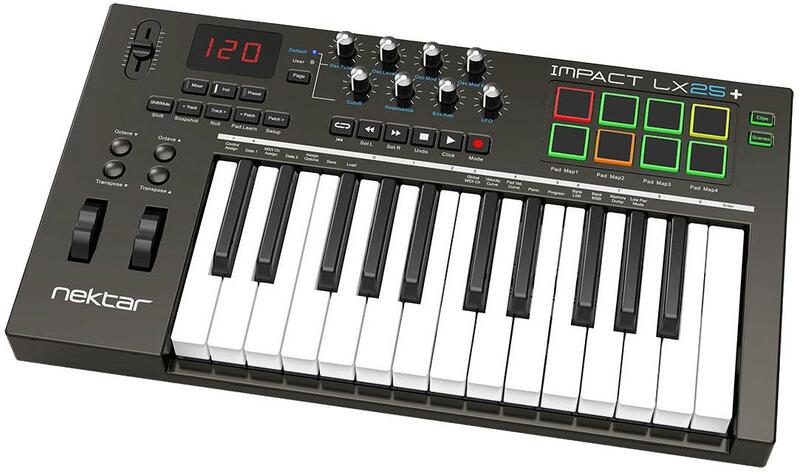 It's hard to go wrong with this stylish 25-Key MIDI controller, do check it out. 86 out of 100. Incorporating 125+ ratings and reviews. The Impact LX25+ features Nektar DAW Integration (here's a list of integrated DAWs) that provides pre-mapped controls for most DAWs. It has dedicated navigation and transport controls and presets that allow you to integrate controls within your DAW. The velocity sensitive keys come in a full-size piano-style build for real-time synth and piano playing. Dimensions: 18.75" x 10.5" x 2.75"
This MIDI controller has all the essentials for most users, which makes it a good value for its price. Many reviewers confirmed it worked seamlessly with most DAWs, such as Logic Pro, FL Studio, Garageband, and Sonar (since re-branded as Cakewalk by BandLab). Users discussed how the controls, keyboard, and pads were responsive and easy to manage when it comes to their production workflow. Even with its multiple features, it has a lightweight build that makes it portable enough to carry around. Although a few people suggested the plastic wasn't on par with the price, this controller is quite durable. This MIDI controller is great if you are looking for something that has multiple functions for producing music without going overboard on budget. 84 out of 100. Incorporating 225+ ratings and reviews. 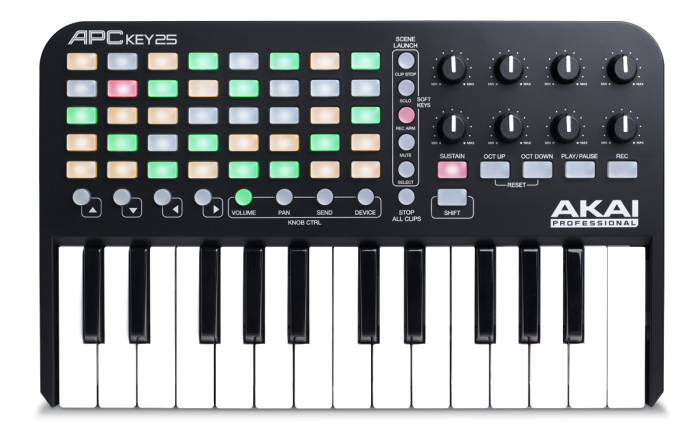 The APC Key 25 is a hybrid of an Ableton Performance Controller and keyboard designed for performing musicians and composers alike. It features a multi-color clip-launching grid used to trigger sound clips or samples. The tri-color lighting shows three clip statuses—loaded, playing, and recording that provides visual feedback so you can perform efficiently without looking at your computer. The controls are pre-mapped with Ableton Live for easy set-up while the knobs assignable for custom mapping options. Dimensions: 12.25" x 7.6" x 1.6"
This MIDI controller integrates so well with Ableton that it lets users manage controls smoothly without them relying too much on a computer keyboard or mouse. Many users found this great for triggering MIDI and launching loops, which makes it ideal for live performance. The build of this controller overall is very durable and compact. For a lot of controls and features, it's relatively affordable and easy to set-up. The downside for this controller is its lack of velocity control. Some users compensate by adjusting velocity within their DAW. Since the keyboard comes in a smaller size, it's not as playable for those who prefer full-sized keys. In his MusicRadar review, Mark Delaney said the keyboard has a "kinda squishy feeling, but definitely good enough to get an idea down, or to use onstage for simple melodies or bass parts." This is a good choice for electronic musicians and beginners alike. 85 out of 100. Incorporating 60+ ratings and reviews. The Korg nanoKEY Studio is not your typical MIDI keyboard, rather it is designed to be a portable music production tool with loads of DAW control features. It combines 25 low-profile keys with 8 velocity sensitive pads and 8 knobs, but its most stand out feature is the inclusion of a X-Y pad similar to the ones found in Korg KAOSS. As if those control options are not enough, Korg also equipped the nanoKEY Studio with multiple function buttons, convenient Bluetooth connectivity, along with compatible iOS, Windows and Mac music production software. Dimensions: 10.94" x 6.3" x 1.30"
Many electronic musicians and producers are impressed with the NanoKEY Studio's balance of features and portability. Software compatibility is also appreciated, which together with its Bluetooth connectivity results in a very convenient MIDI controller. Simon Sherbourne of Sound on Sound concludes his review by saying: "The NanoKey Studio works with anything and is a great ultra-portable all-rounder." The NanoKEY Studio's keybed is not meant to impress piano players, rather they behave more like trigger buttons to cater to today's sample driven music. 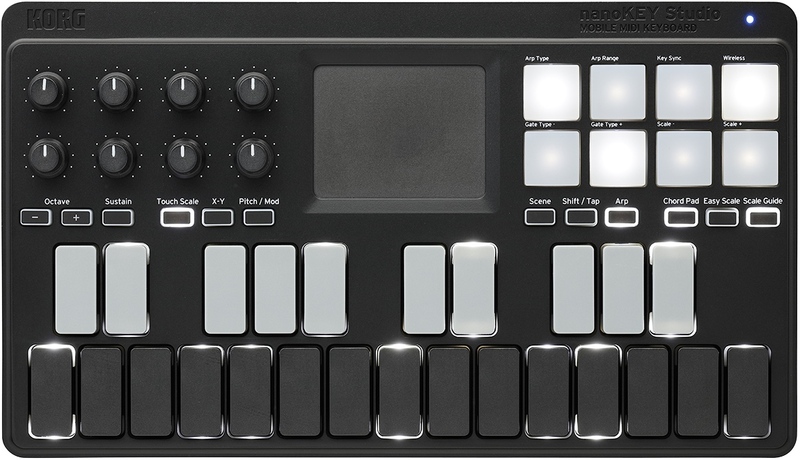 Get the Korg NanoKEY Studio if you're looking for a compact and portable music production MIDI controller. 87 out of 100. Incorporating 100+ ratings and reviews. The Novation Impulse 25 is very popular with Ableton users as reviewers report that it works very well with this DAW. Its Automap software also supports Logic, Pro Tools, Cubase, Reason/Record and Live. Keys: 25 velocity sensitive piano style keys with assignable aftertouch. Pads: 8 velocity sensitive pads. Buttons: 6 function buttons (4 with LEDs), 3 control switch buttons with LEDs. Octaves: 9 with the Octave Up and Octave Down buttons. Bundled Software: Ableton Live Lite, Novation Bass Station VST and AU plug-in, and Automap DAW and plug-in control software - NB the Automap feature doesn't work with Pro Tools AAX plugins. Power: USB powered and includes a DC power socket for an optional power adapter. Connectivity: USB and 5 pin din MIDI in and out sockets. Compatibility: Mac OS X + Windows 10, 8, 7, Vista, XP. Dimensions: 22.4" x 15.1" x 6.29"
It also comes with an Arpeggiator which is well liked although it does not have a latch key. The most often cited negative is that the knobs are a little loose making precise positioning a bit finicky. The Pads and the overall build quality are often cited positively in customer reviews. 87 out of 100. Incorporating 80+ ratings and reviews. 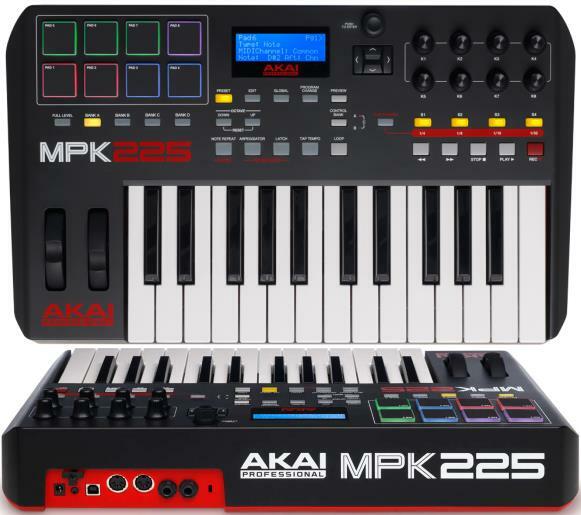 The Akai MPK225 certainly isn't the cheapest 25 key controller out there, but it is highly regarded by people who have bought one and reviewed it. While some small controllers are primarily intended as an input device, Akai have designed this to be a completely playable instrument and that's one of the reasons it's so highly regarded. Keys: 25 full size semi-weighted with aftertouch. Pads: 8 which are velocity and pressure sensitive and they light up MPC style (with full RGB). Octaves: 10 by using Octave Up and Octave Down controls. Bundled Software: Ableton Live Lite DAW, MPC Essentials software sampler, and the Air Hybrid 3 and SONiVOX Twist virtual synths. Power: USB powered and can use an optional 6V DC, 1A, power adapter (sold separately). Connectivity: USB and 5-pin MIDI out and MIDI in. Compatibility: Mac OS X 10.4.11 or later + Windows 10, 8, 7, Vista, and XP. It is also iOS compatible but you'll need a CCK and external power supply as well. Dimensions: 19.25" x 11.75" x 3.63"
Being an Akai controller it also comes with a lot of MPC features including Note Repeat, Full Level, and an arpeggiator. The common aspects highly rated are the quality of the pads (not surprising given that Akai invented them) and the quality of the keys which has been Akai's weak point in the past on small controllers. The other most commonly praised feature is the overall quality of build. The main downside, which was reported by a few Mac users, is that it doesn't work as well with Logic Pro X out of the box as some other controllers - it takes a bit of extra configuration to get the most out of Logic..
We looked at all the 25 key MIDI controller keyboards available at major online American music gear retailers and selected 22 of them to put on our short list. We then gathered feedback on each one in the form of ratings, reviews and discussions and analysed that information both with the Gearank Algorithm to produce scores out of 100 for each of them, and to provide us with the information to report on each of the highest rates ones we recommended above. Over 7,500 review and rating sources were used during this process. For more information about our methods see How Gearank Works. Although there are many more 25 Key controllers available, we recommend only buying ones that have a Gearank above 80 - if you go much lower than this you're starting to get into ones that are below average. If you have any questions or comments please post them below. I have updated the Key Features above to include the weight of each of the keyboards. Submitted by Jason Horton on Feb. 2, 2017. I've made an additional update to include the dimensions of each keyboard - this is useful when deciding what type of keyboard stand or stand attachment to get. Submitted by Jaya (not verified) on Jun. 29, 2016. Great helpful article, thanks! It was really helpful that you included whether or not they each had actual midi ports. Submitted by Jason Horton on Jun. 29, 2016. I'm glad you found that part useful. When doing the research for this gear guide I was surprised to find that a number of people had bought keyboards with only USB MIDI when they actually needed one with a classic 5-pin MIDI port. Submitted by PhiL (not verified) on Sep. 25, 2016. I always use 5-pin MIDI. Don't understand why manufacturers dropped the 5-pins and make things more complicated with USB plug adapters. Happy to see here a clear overview of 5-pins keys, great help to me in buying the right hardware. Thanks a lot! Submitted by Jason Horton on Jun. 30, 2017. Submitted by OJK Tardis (not verified) on Jul. 19, 2017. NOVATION SL25 MK2 has 8 encoders, 8 pots, 8 touch-sensitive faders, 8 pads, pitch/mod expression stick, XY pad, and 25 full size keys, speeddial, and automap for automatic DAW and VST control. Submitted by Taylor (not verified) on Sep. 12, 2018. Thank You best one as far as i can see. Submitted by Fernando Sousa (not verified) on Sep. 25, 2017. The Arturia MiniLab has been discontinued and replaced by the Arturia MiniLab MkII which didn't have sufficiently high enough ratings to be included in this guide at the time of publication - it is on our watch-list and we may recommend it if it scores high enough when we next update this guide. Submitted by JasonG (not verified) on Nov. 5, 2017. I'd be interested in a comparison of Bluetooth-enabled versions of these devices. Submitted by Jason Horton on Nov. 6, 2017. Thanks for the feedback - we'll look at doing that when we next update this guide. Submitted by Jim LIttle (not verified) on Jan. 10, 2018. 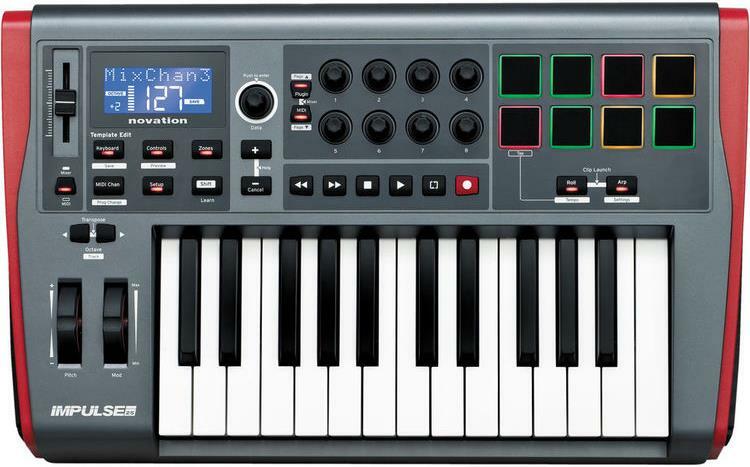 It's so annoying that you didn't list whether the Native Instruments Komplete Kontrol S25 has full-size keys. That's the most important consideration, in my opinion. Submitted by Martin (not verified) on Feb. 1, 2018. I too am waiting for Arturia Minilab MK2 - people say that it has improved much and is better that many competitors for this price in mini MIDI segment. Also, do you take negative reviews into account? Because there has been some noise around M-Audio Oxygen line quality issues - lots of reports of keys acting weird, triggering double notes, not triggering at all etc. So, I'm not sure if your current pick is safe to recommend unless M-Audio get their stuff fixed in some new M5 edition. Submitted by Jason Horton on Feb. 14, 2018. Our ratings take account of all types of reviews including positive and negative. You can learn more about how our ratings are calculated, and what they mean, in How Gearank Works. Submitted by Stefan (not verified) on Jun. 9, 2018. Seriously well-considered and well-written article. Thank you very much Stefan! Submitted by Jason Horton on Jun. 9, 2018. Submitted by Jason Horton on Sep. 26, 2018. Submitted by Jason Horton on Nov. 27, 2018. The following keyboard has been removed from our recommended list above due to being discontinued by the manufacturer: Native Instruments Komplete Kontrol S25.